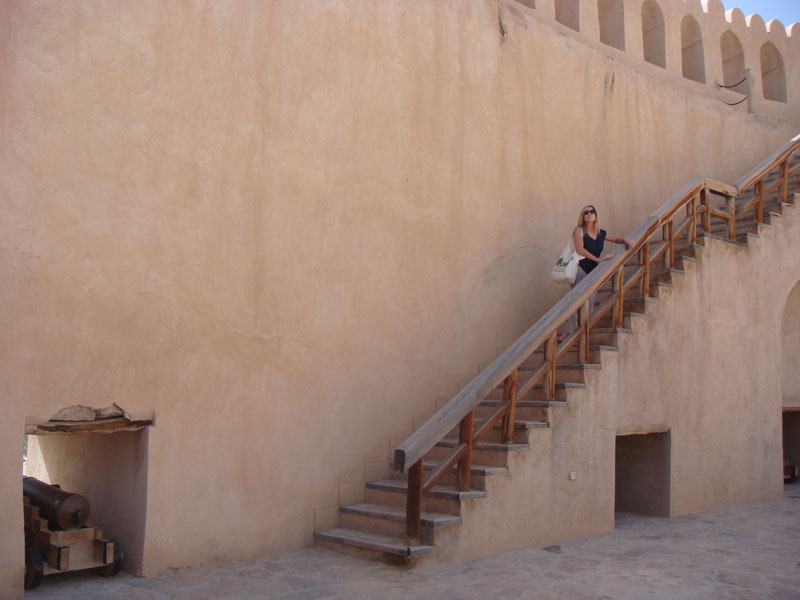 The Nizwa Fort is included in The 1,000 Places to See Before You Die list, a kind of bucket list for travelers. 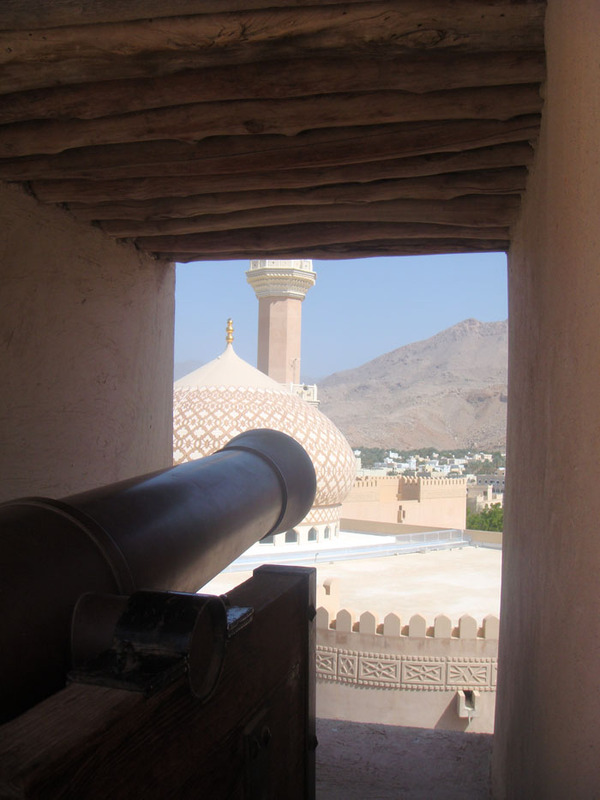 It is Oman’s oldest fort. The Omani forts were built after the Portuguese started arriving in force in 1507. Like most historical sites in the Middle East, the forts were left to ruin until the government decided to add tourism to their list of industries. The original fort was renovated to stabilize the structure and its original authenticity was lost. Now it has the look of an amusement park attraction with its maze of passageways. 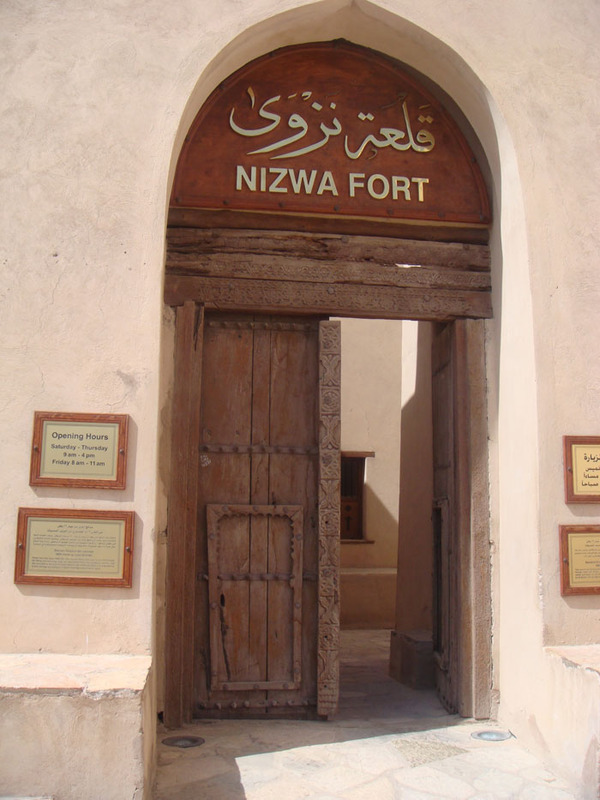 Nizwa Fort is a museum. 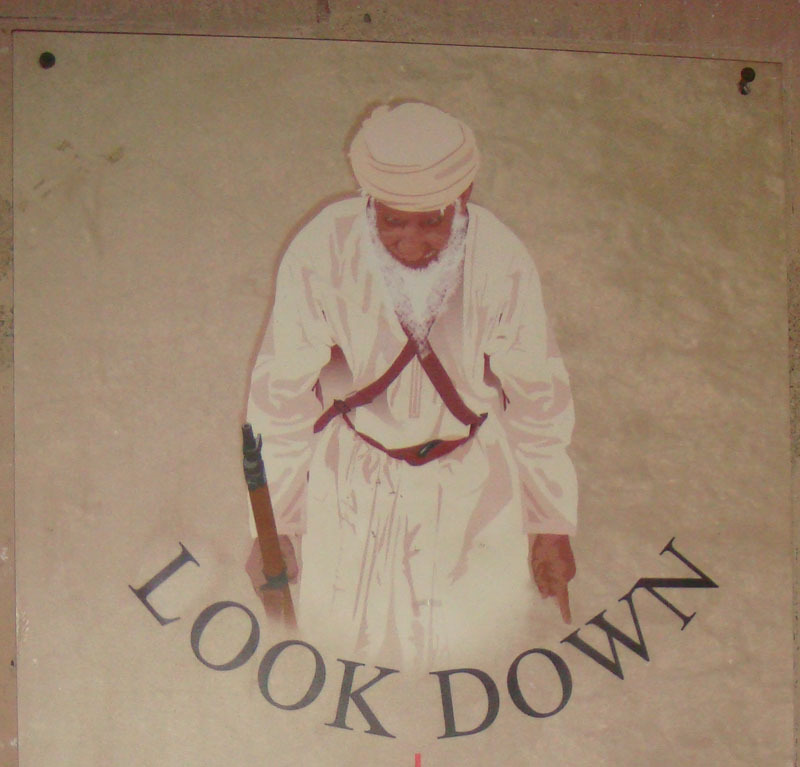 There were signs posted, describing the items presented and giving a short history of Oman. 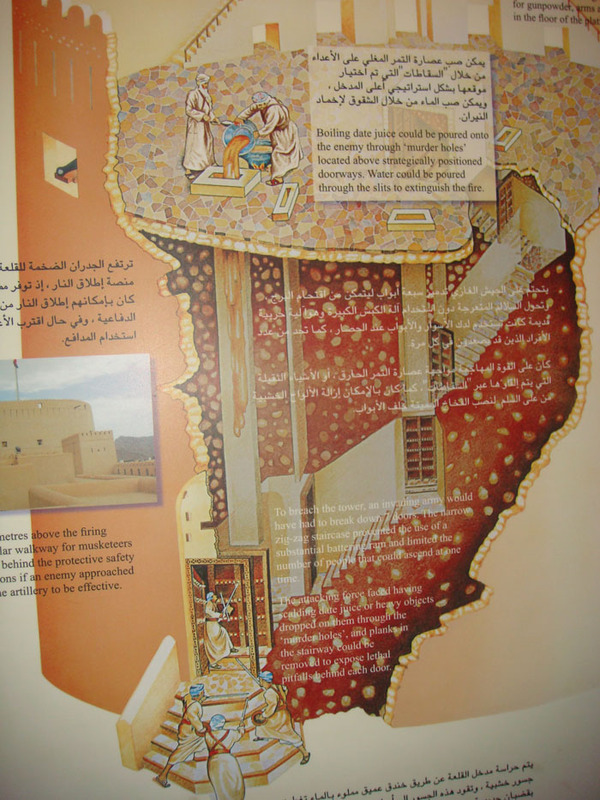 The poorly lit exhibits depict different aspects of Omani life. Our guide led us through the rooms and pointed out the obvious. As we asked questions, he read the answers to us off the posted signs. One posting discussed the Abadiyyah arm of Islam that most Omanis identified themselves as. I had never heard of Abadiyyah before. “Abadiyyah is different than Sunni and Shiite?” I asked Zaher. “Yes, we are not the same. We are not like Shiites.” He didn’t offer more information and I returned to the small inscription. 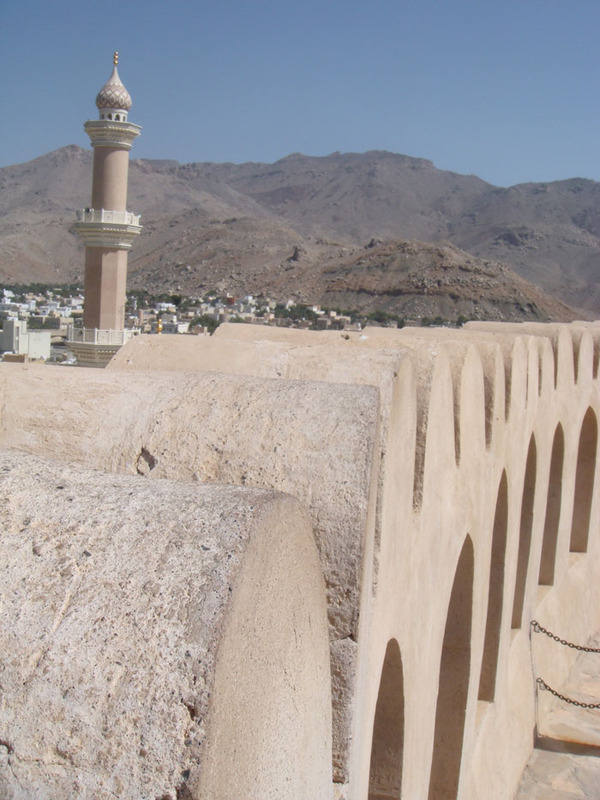 Abdullah ibn Abadh brought Islam to Oman. Basically Mohammed the Prophet PBUH sent him a short but sweet letter saying if you do not convert, then our swords will convert you. A copy of the letter hung on the wall. After Zaher guided us through most of the fort, we came to the large central tower. The stairs led upwards to the large round courtyard. At this point he left us, saying he would go get the car and wait outside. Goldi and I climbed the stairs and followed the instructions. We were laughing like 12-year olds and taking pictures of where hot palm oil was poured down shafts onto enemy soldiers. As we had fun an elderly gentleman walking alone stopped behind us. I assumed he was taking a rest as the stairs were quite steep. After standing awhile on the stairwell, he barked at us. I did not understand why he had not simply passed as there was enough space for him. He must have thought he was being polite waiting for us to finish. But we were having too good of a time to hurry. It was another instance of cultural miscommunication. We finally emerged into the courtyard and realized why our guide had left us. Taking photos of the surrounding town and mosque required climbing three sets of stairs. We watched elderly European couples in street shoes and Indian ladies in multi-colored saris and sandals climb the stairs with their babies following. “Good thing I wore my authentic REI action pants and climbing shoes,” I laughed. I was over-adventurized for the day. Everything was made for easy access. With a tiny bit of fitness, all the sites were manageable. We took photos from all sides of the fort, then headed back down. 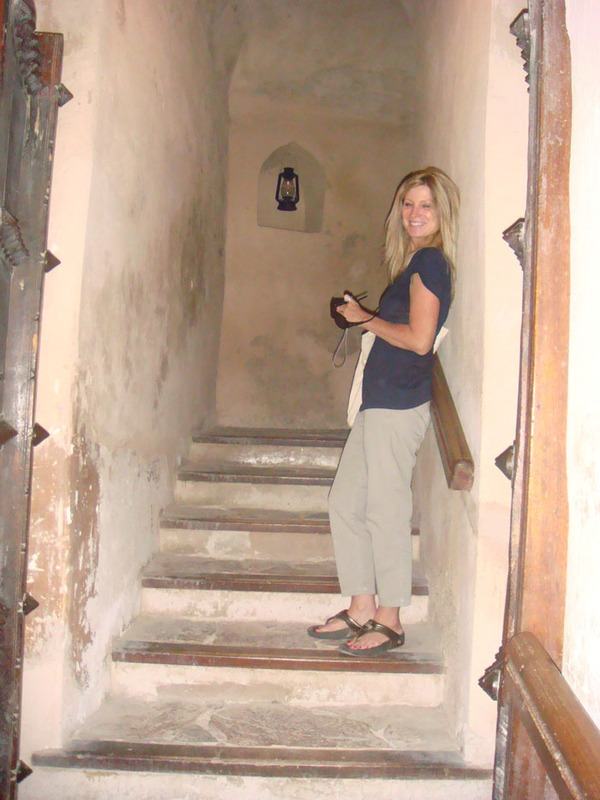 At the bottom of the stairs was a small, heritage shop that sold frankincense, candles and other small souvenirs. Omani Dhofar frankincense was a must buy as it is the finest in the world. It is probably the best opportunity to purchase a nice quantity of real Dhofar for only two riyals. We continued through, passing the water well exhibit and finding ourselves at the front gate. Zaher was waiting outside in the car. 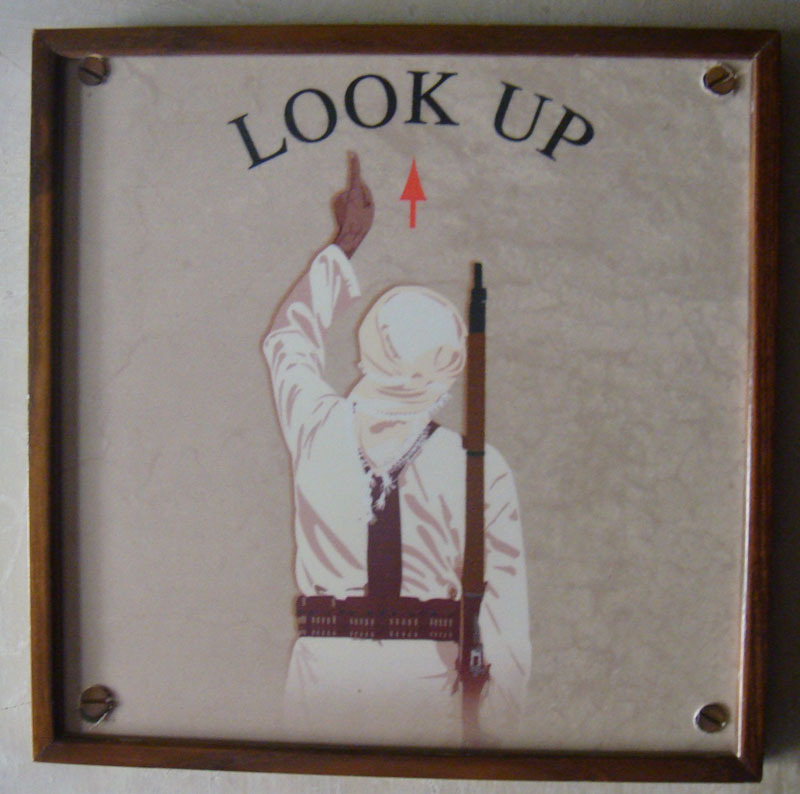 We waved a single finger “one-minute” at him and walked into the Omani Crafts House. Again there were shelves of pottery, bowls, incense burners and water pots. There were some cute purses with Omani women’s dresses on the outside, swords and silver items. We left without purchasing anything and jumped in the car. 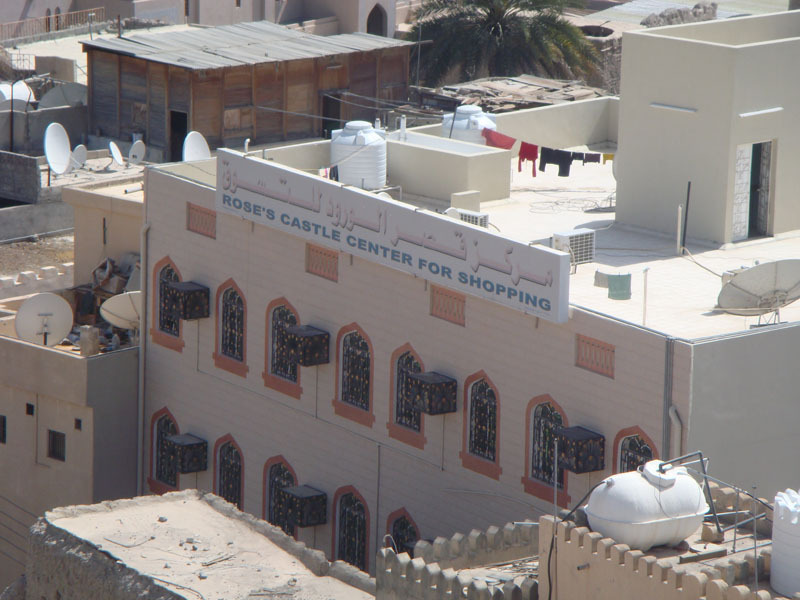 The only place in Nizwa we didn’t try was Rose’s Castle Shopping complex. Hi, just a note from Omani Heritage Gallery. We can assure you that the frankincense sold at the Gallery “heritage shop” is cultivated in the Nejd region of Dhofar, purchased directly from the harvester and that is the ‘real Dhofar’. It is then packaged alone, or with pottery made by an Omani potter in Bahla, or by an Omani basket weaver from desert areas of Oman. We are a not for profit organisation that encourages and promotes Omani artisans. Thank you so much for commenting and clarifying. I know it must be real since you took the time to speak up. I will be certain your comment is included in the posting. I am glad Oman is ensuring these natural and traditional products are still made.